when sam asked for cereal this morning (well after he'd eaten his breakfast), i thought it would be fun to make up some rice krispie treats (i haven't made real rice krispie treats in ages, so i had to look up the recipe online—it can be found here), so he stood at the counter and helped me count how many cups of cereal, and how many cups of mini-marshmellows. 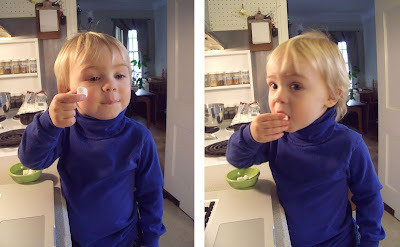 of course, after "tasting" about half a cup of marshmellows, he wasn't actually interested in eating any treats, but it was kinda fun anyway. he's now standing behind me washing dishes and singing "let's. go. fly. kite. up to heightest tight…"